Sunday Photo; Buddha’s eye – Wake Up and Laugh! The one “rule” I’d set for myself when posting Sunday Photos was that I would only post images from Korean temples. Well, today, I’ve decided to take a bit of a vacation to Bangkok, where Chong Go Sunim has been for the last few days to attend a short retreat at the Bangkok Hanmaum. He’d mentioned to me a few times before that he really had a nice feeling from Wat Pho, one of the most famous attractions in Bangkok, the temple that houses a massive gold Parinirvana Buddha. 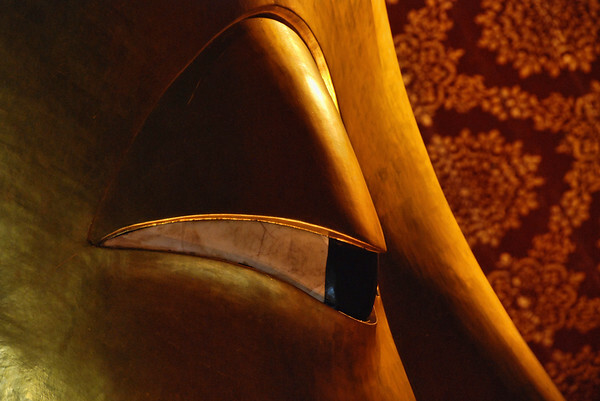 During my last trip to Bangkok, I took this photo of the Buddha’s eye, about to close for the last time in this realm. Thank you for taking this trip to Bangkok with us via the blog Joseph! Nice one! And great close-up the Buddha’s eye! (And yes, Chong Go Sunim really does have a good connection with this temple I think – he’s re-visited it twice on this trip). Of course I want to blog about the workshop soon, but it was all so rich, so powerful, so incredible that I hardly know where to start. I’m waiting for some of the people who came along to kindly send me some photos, and I’ll put them up as soon as I can. But finding words is going to be difficult. I can honestly say that it was the very best English-language Dharma event I’ve ever attended in my life. I’m still reeling. Thanks again so much for your lovely words and images Joseph, and for joining us here in Bangkok in spirit. Even more striking in larger formats. very impressive, indeed! What a marvellous picture! Have you all a nice day!